Flossing Is Good For The Gums, But Doesn't Help The Heart : Shots - Health News Medical experts have long thought that gum disease can cause heart disease. But now they say no; it's other health issues like smoking and lack of exercise that are causing both. But this doesn't mean you can stop flossing. It's still a good idea. But it won't protect you against heart disease. 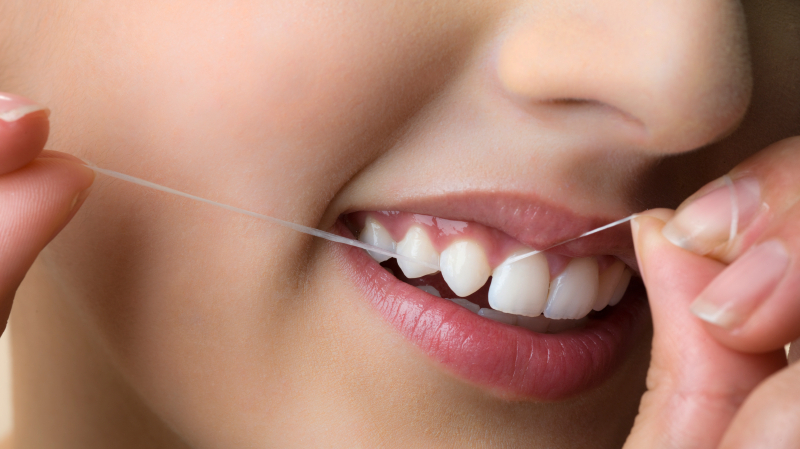 Think flossing and brushing is helping to fight off heart disease and stroke? Think again. An expert panel of dentists and cardiologists, writing in the American Heart Association journal Circulation, says there is no evidence that treating or preventing gum disease has any direct effect on heart health. That's a big turnaround. For the past decade, the medical establishment has been telling people that cardiovascular disease can be caused by poor oral hygiene. Why the change? "We set out to look at all of the science," study author Peter Lockhart, chair of oral medicine at the Carolinas Medical Center, tells Shots. After reviewing dozens of studies published over the last 20 years, the panel concluded that gum disease and heart disease do occur together - but despite conventional wisdom, one does not cause the other. Studies that appeared to show a link, the panel found, often failed to control for outside factors that contribute to both diseases. The common thread between oral and cardiovascular health is inflammation. In gum disease, the culprit is bacteria that cling around the roots of the teeth and irritate the gums. In heart disease and stroke, it's plaque that builds up in arteries, potentially blocking blood flow. For more than 100 years, medical experts have speculated that gum disease might contribute to heart disease, either by producing chemical signals that cause inflammation elsewhere in the body, or by allowing bacteria from the mouth to enter the bloodstream and contribute to plaque buildup in arteries. Oral bacteria do get into the bloodstream, especially when gums are diseased and bleed easily. But when it comes to heart disease, Lockhart says, it's not clear "whether they're part of the pathologic process or whether they're just there." He says it's much more likely that gum and heart disease simply share many of the same risk factors, such as smoking, obesity, and stress. Like smoke and heat, the two conditions often go together. But instead of one causing the other, there are outside factors – the fire, if you will – that cause both. People who focus on those common risk factors, Lockhart says, "will have a very measurable positive impact on their overall cardiovascular disease." In an email, co-author Ann Bolger, chair of cardiology at San Francisco General Hospital, writes that it's unlikely anyone has treated gum disease as "a 'one stop' solution for avoiding cardiovascular disease." But she says it's important that doctors don't overemphasize unproven health measures. "It is not fair to frighten a patient who may have reasons why they can't prioritize dental care (access to care, limited health care dollars), and it's not a good idea to distract patients who may have really good reasons to be concerned about their cardiovascular risk away from prioritizing control of powerful, proven risk factors like smoking, hypertension and diabetes," Bolger writes. Of course, this doesn't mean you should stop flossing, or skip dentist visits. "Oral health is important," Lockhart says. "[People] really should try to maintain good oral hygiene...just for its sake alone."